UAE-based company Calidus has unveiled for the first time its new light attack aircraft, the B-250, with multirole capabilities at Dubai Airshow 2017 on 12 November. 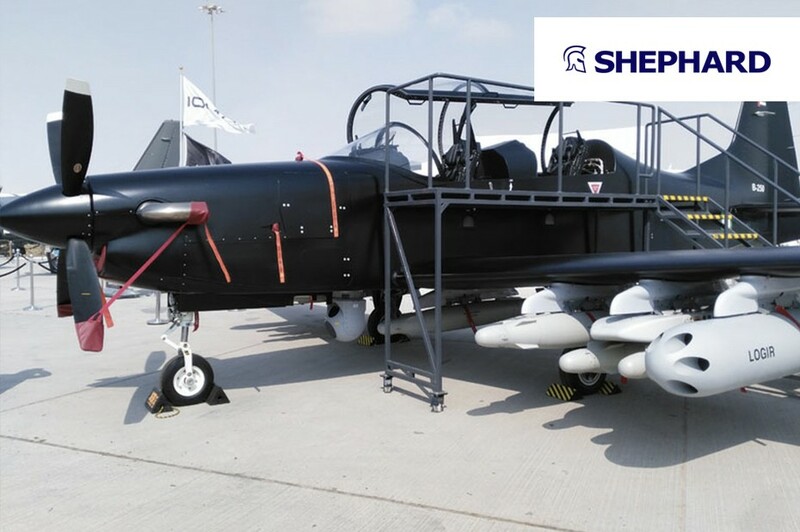 The aircraft is the first military fighter to be developed in the country and was a result of a capability gap, Hamdan Abdulla Al Shkeili, chief software engineer at Calidus, explained to Shephard. The first delivery of the aircraft is expected imminently. ‘Today we are introducing our project the B-250. It has very strong, cutting edge avionics to enable the aircraft to do its missions accurately and precisely,’ he said. The Pro Line Fusion avionics suite will have graphical interfaces that are integrated with a digital HUD and multi-function display windows. Terrain awareness and EO/IR video displays are also expected to provide pilots with greater air space awareness. The single/dual pilot aircraft’s mission capabilities will be centred around counter insurgency, ISR, close air support and advanced training operations. In relation to the weapon capabilities, the B-250 can an array of weapons with capacity for seven munitions as well as an EO/IR. ‘It is designed to be flexible for end users. It can carry different kinds of weapons and rockets. It is fulfilling a gap that the market is needing for modern warfare with very low operational costs,’ Al Shkeili commented. He explained further that the company is receiving a lot of domestic and international interest in the B-250 and ‘active communication’ is currently taking place with end users. Novaer developed the aircraft’s structure which comprises of carbon fibre which was a key requirement from Calidus due to its lightweight capabilities. ‘It has outstanding performance due to the fact that it is the first aircraft in this category to be totally made of carbon fibre. Carbon fibre means it has better weight and anti-fatigue [components] which gives the aircraft more lifetime,’ Al Shkeili said. The production facility for the aircraft is in the early stages of development and will be located in Al Ain although Al Shkeili confirmed that there is an opportunity for a ‘very high production’ at the site. At this stage, the B-250 has flown more than 50 flight hours. According to reports, it is believed that in the summer of this year the first prototype of the aircraft undertook its first engine spin. Currently, there are two aircraft at the show one on static and one participating in the flight display. There was no further confirmation on any other B-250s at this stage. It utilises one 1,600shp P&WC PT6A-68 engine and the B-250’s maximum payload is 1,796kg. the aircraft’s service ceiling is 30,000ft with a range of 2,400nm at 301kt.